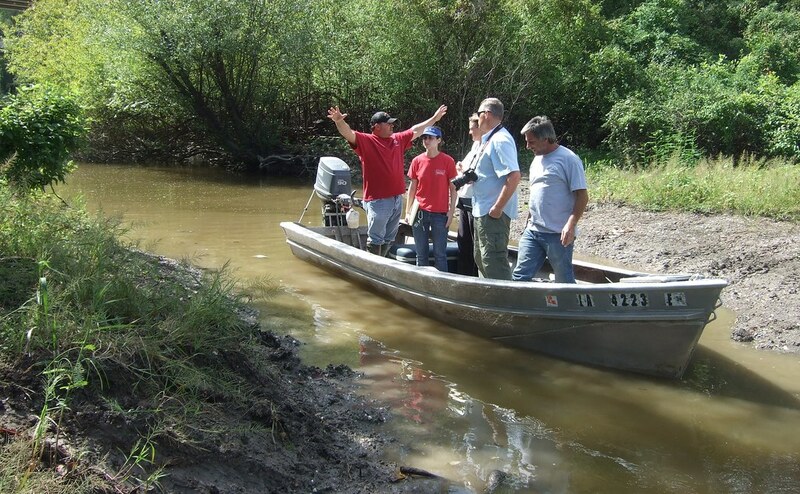 Dean Wilson of Atchafalaya Basinkeeper invited us to take a low-water tour with Jody Meche of the Louisiana Crawfish Producer’s Association West, to see the challenges healthy wetlands face in their neck of the woods. Illegal access roads are damming up the bayous of the Atchafalaya. We do not want Bayou Brown to be roadblocked. Just as the natural tidal flow of water through marshes is essential for their health, the natural cycle of flooding and draining of swamps is necessary to keep them healthy and productive. By blocking the healthy flow of water, these permanent limestone roads do damage to swamps in a similar manner as the thousands of miles of spoil banks damage our marshes. (left) Jody Meche explains the grim future of this navigable bayou, likely to be illegally filled and culverted. 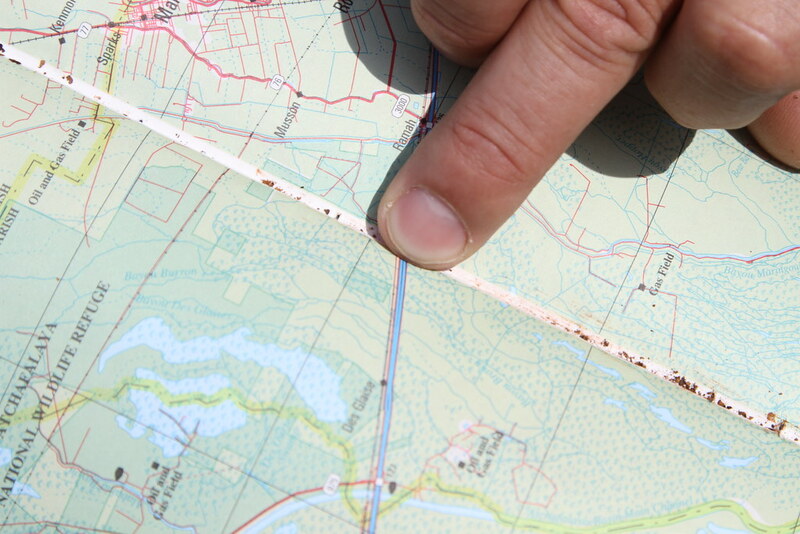 An ATV trail often marks where the illegal roads will be built. 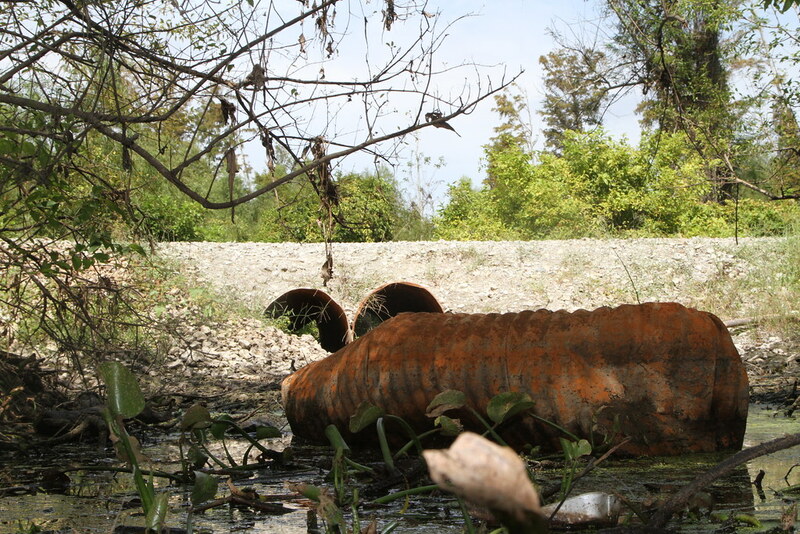 (right) An older, failed metal culvert has been dumped in the bayou, and replaced by other culverts. In addition to the road barrier, the limestone from the road spills into the channel over time, permanently blocking natural flows as well as fish and wildlife. (Left) Pointing at our location within the Bayou Brown area, west of the launch at Ramah. Bayou Brown is a braided system—with multiple channels, all of which are threatened by illegal roads. 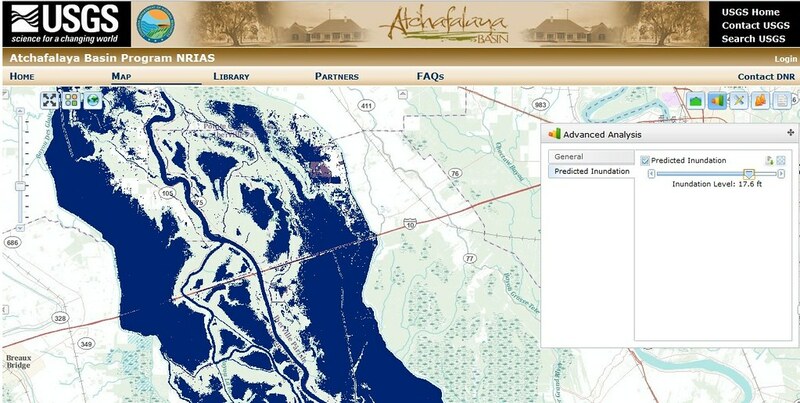 (right) A screencapture of the NRIAS map, with the Basin flooded at 17.5 feet. Illegal roads along the elevated I-10 are drying and silting up the water bottoms (in blue) in large areas north and south of I-10. Although the problem—clogging healthy flow of our waters—is the same, the effect is radically different. In the low-lying marshes, the spoil banks turn starved wetlands into ponds and open water. In the swamp, these bayou-fills cause the wet swamp bottoms to dry up, which alters the soils and changes which trees thrive there. Either way, a healthy wetland system is choked and dies. And just as placing levees too far out into the estuary tricks us into building homes in unsustainably low areas, artificially silting in the swamp bottom will spur unsustainable development into the Atchafalaya Floodway. Not to mention the logging and cutting of our critical cypress forests! We will update this blog with more information as it develops. 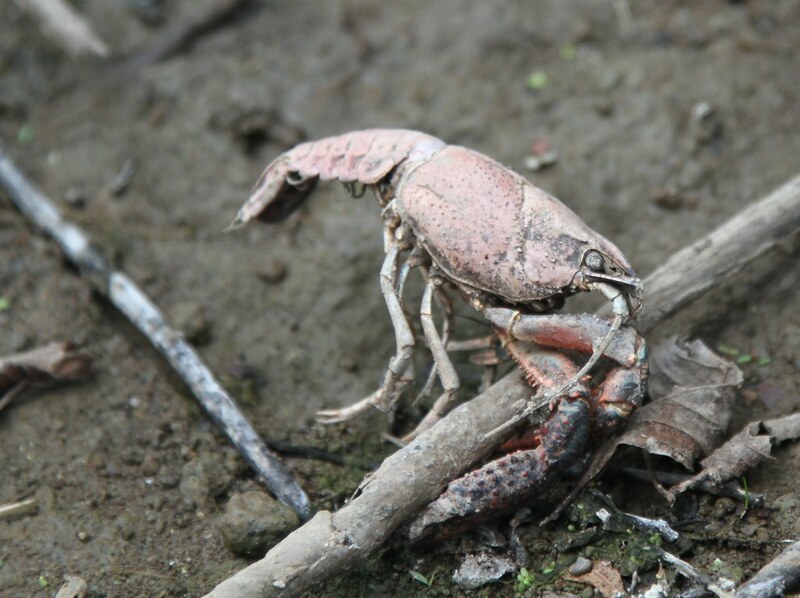 For more details, check out the Atchafalaya Basinkeeper’s website here. And for more about Jody Meche, and life in the Atchafalaya Basin, watch this video from Garden and Gun Magazine. Scott Eustis is GRN’s Coastal Wetland Specialist.